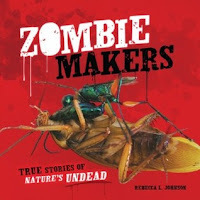 Zombie Makers: True Stories of Nature's Undead by Rebecca L. Johnson. Grades 4+ Millbrook Press, October 2012. 48 pages. Review copy provided by my local library. Form meets function in this great children's nonfiction title. You won't want to miss Zombie Makers for your library and classroom shelves! So, first of all, zombies are so in right now and this is a book that gets it right. With huge, color pictures of super gross stuff (like fungus coming out of an ant's head) and an ear-catching title, this book oozes kid appeal. The spreads are short and sweet with the perfect text-to-photo ratio that'll keep kids turning the pages (and probably exclaiming "Eeeeeew!" like I did on every spread). A quick stat chart on every new animal gives the animal's proper name, its nickname, its "zombie victim" (read: host), and its location. The spreads are embellished with splattery red, green, and black paint, perfectly evoking the zombie vibe. And the book provides tons of information. It's a topic that has a lot of appeal and the facts are presented in an engaging tone. Most of the spreads conclude with some information about the scientists who study or discovered that particular "zombie maker" or some additional information about it. The back matter makes my heart skip a beat (particularly satisfying in a title that has so very much kid appeal). Back matter includes an author's note, a glossary, source notes, a bibliography, an index, and a list of further resources. For some reason, this book doesn't have the feel of a Sibert winner (maybe because the topic seems trendy? ), but I certainly hope the committee will give it strong consideration. Nonfiction for kids? YER DOIN' IT RIGHT! Pair this book with Exploding Ants by Joanne Settel for more fun facts about amazingly weird animals. Hey, Betsy of A Fuse #8 Production also reviewed this book, so go check that out. Zombie Makers is on shelves now! And HEY, happy Nonfiction Monday! This week's roundup is over at Practically Paradise, so make sure you check that out, too.